I am in love. 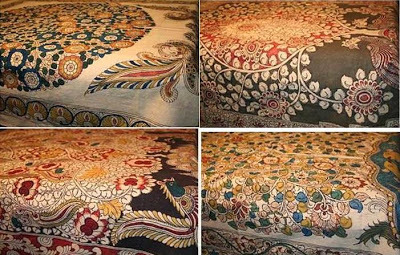 With the amazingly rich textile tradition of India! 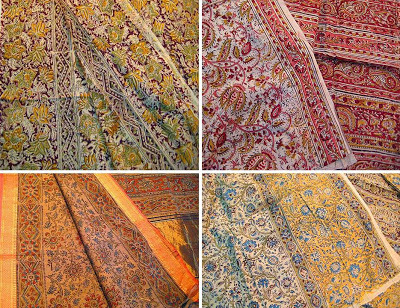 As I select exquisite fabrics and furnishings for the upcoming bazaar, I can not resist buying double the quantity, so that I can have them at my home too. You can very well imagine what this is doing to my budgeting and thoughtful financial planning! 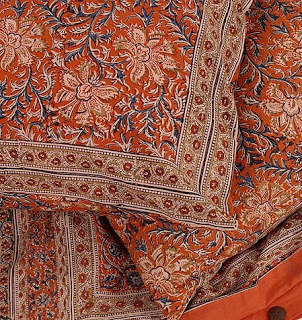 One such rich textile art that I am planning to get is Kalamkari. 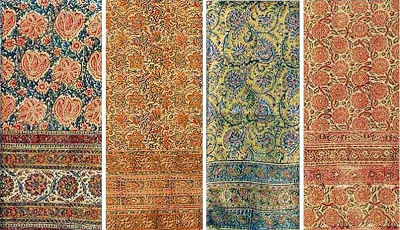 Kalam means ‘pen’ and Kalamkari literally would mean ‘Pen craft’. The name is believed to be derived from trade relationships between Persian and Indian merchants as early as the 10th century. Interestingly, European merchants had different names for similar textile art in their geography: the Portugese called it pintado, the Dutch used the name sitz, and the British preferred chintz. 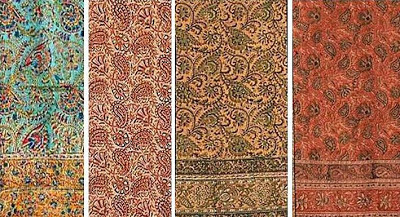 Kalamkari today is synonymous with both painted and hand block printed textiles that incorporate natural vegetable/organically derived colors, and the art is primarily practiced in the state of Andhra Pradhesh in India. beautiful.. brilliant stuff… i was lukin for something like this since a long time..
Lovely prints glad I found you! OMG!!!! absolutely mind blowing blog i am so hooked on it n a bit confused where to start from all the articles are too good. LOVED each of the Kalamkari in contemporary furnishing section 🙂 I WANT! 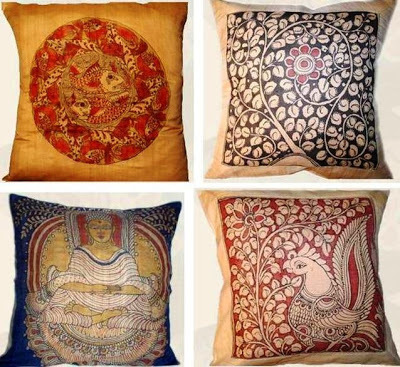 acaligurl: Yes, I love the pillows too…kalamkari looks lovely on silk. You are right Lynne, the feel of old cotton or linen is the best! beautiful selection. i like the pillow with the turquoise. really nice that it is natural too. how gorgeous! it would be hard to resist buying the whole selection because they are all so pretty! looking forward to seeing this stuff in your store. absolutely beautiful. but i love them when they are faded and so soft from use. my absolute favourite fabric! Nice. The throw pillows especially. I would cover my walls with iT!!!! the best! and better as they get washed and fade! vow! this is organic, with a capital O.